Recently, about 20 bloggers from Penang and Kedah were invited to CSL’s Spice MI700 DroidPad preview at Gurney Plaza, Penang. As Android has been the next state-of-the-art gadget in the market other than the Apple’s 10” iPad, all of us were very eager to learn more on what interesting features this 7” newly launched tablet has. Now let’s us study more in depth into the Spice MI700 DroidPad, a 7” tablet that runs on Android 2.2 Froyo, the latest mobile open platform developed by Google. It enables you work, play, shoot photos/videos/webcam/chat or even track your location with its in built GPS tracking device. It also supports a regular sized SIM card and is capable of supporting quadband networks such as EDGE, GSM, UMTS and HSDPA. It also has a WLAN 802.11 b/g. Measures at merely 179.4mm H x 110mm W x 11.5mm T and weighs at roughly 410gms, the tablet came with a long lasting 3240 mAh Li-Polymer battery. It’s equipped with Bluetooth V2.1 + EDR support, front facing VGA camera and and a back facing 3MP autofocus camera, which if by connecting to a Bluetooth headset, you would be able to make voice calls or video conferences right at your tip with ease. The Spice MI700 DroidPad is powered by Qualcomm MSM7227/600 MHz chipset with ROM/RAM of 512MB respectively and would be able to support a microSD card up to 32GB. You can check out the full specification at the CSL website. I did a little time exploring more on the set but I would think I may need to spend more in the future to get accustomed to some of the features. Here are some of my feedbacks I can provide at the mean time. 1. The booting time is quite acceptable at almost less than a minute considering that not that many programs had been installed into the system yet. 2. The screen resolution is quite acceptable, provided you do not place the screen protector sticker, which eventually caused the colors to be slightly pale looking. 3. Scrolling, touching and swiping can be quite smooth with hardly any lagging although I did face some areas where my touches needed to have at least two inputs. I have no problems with the smartly spaced virtual keyboard. 4. As for games, it rocks all time. No lag at all so far. 5. Reading with its e-Book reader can be fun as the word size is just right for my vision. Page transition is without any haste too. 6. I have no problems viewing videos through YouTube or any other online video sites. I have yet to test out on the video player but I guessed I may have to download some players to test the system out soon. 7. I also do not have any problems checking out my emails as well as connecting to FaceBook or Google Talk. I have yet to test out on some of the FaceBook games. 8. Checking GPS reading from Google Maps was fine. I’ll check on the free one year MapKing GPS Navigation system once I get it activated soon. 9. With two speakers installed at both sides of the tablet, the sound of music through the music player is quite acceptable. 10. Browsing and switching websites is smooth flowing, except that I wonder why CSL missed out the feature of allowing FLASH related graphics to show up on the system. Hardware or software limitation? 11. The quality of photo shooting through its 3MP camera is quite acceptable, considering that you won’t really need such high quality photos to be posted online. 12. I have yet to test on the battery life but I guess all gadgets would not last more than a few hours if heavy usage. 13. The tablet’s pre-installed full version of Documents To Go is so cool. It allows you to read, create, edit, cut or paste Word, Excel, Powerpoint and PDF files so easily. I love this so much. 14. As for the pre-installed applications, I felt that some of them such as the Islamic features is not relevant to some of our needs. It would be best if it were to be placed in the Market for those who need to download them. It gets rather cluttered and messy with so many things on the screen. Well, that’s my personal opinion here. 15. Although the tablet might be convenient and light weight to carry around, the price is still too steep at RM1599 (~USD500). Even a NetBook is cheaper than the tablet easily. I personally felt that a price range of between RM1.1K and RM1.3K would be more attractive to capture the market share. You can check out CSL Malaysia’s official website for more updates. 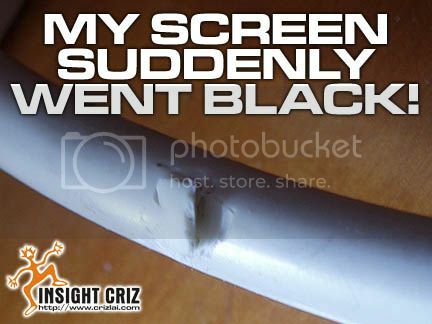 MY SCREEN SUDDENLY WENT BLACK! Don’t you hate it when you have a tight deadline with a project and suddenly your screen went dead? The good news was that my monitor was in a tip top condition. Moreover, it’s one of the great models in the market with a great-looking, thin-bezel monitor that can swivel, tilt, pivot and be adjusted for height. However, I have a problem with the cables. 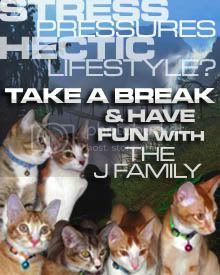 It was not due to any factory defects or whatsoever but the availability of some pets in the household. They tend to be a bit too playful around cables and at times entangled within the maze of those cables. Sometimes while I was busily working on a proposal, my screen would just go black. One of them would have loosened the connectivity while cheekily playing the room. That was not the worst scenario until to date as I had woken up one fine morning to find my cables all being chewed up. Luckily, I have the habit of switching off all the live wires when I go to bed nightly. If not, the whole house might have burnt down by now. I’m in the midst of rewiring all my cables and wires to be pets and child safe very soon. At the mean time, I guessed I have to get more vga cables as backups just in case of any emergencies. Shopping has not been easier since the invention of the barcode scanner during the 70’s. Long queues in front of cashiers were somewhat a history now as all the products in the market today have barcodes imprinted on them to enable faster execution of checking out. But there lies a problem as a shop gets bigger with rapid expansion. 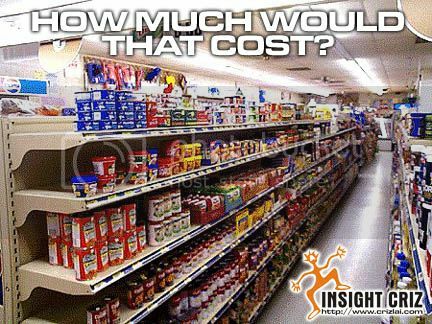 Hundreds of products would be stacked up on rows and rows of shelves and there are chances that some pricing might not be labeled properly. I had encountered such problems on many occasions while shopping in a local hypermarket. Sometimes the distance to the cashier just to enquire about the pricing of a product would require quite a long walk. Most of the time I would just put back the item as I hated the hassle of running around for the sake of just wanting to know the price. Since barcode has been so commonly used in our daily life, it pondered me why some of the hypermarkets around are still not providing this service to its consumers. I won’t think having a barcode scanner within the reach of a consumer would be much burden to the hypermarket. Although some may have a few scattered around, but the quantity might not be enough to cater to the needs of its consumers. I had experienced running few shelves away just to check on the price for a bar of chocolate. Well, it might be a great way to sweat it out before indulging with the rich chocolate bar but that does not necessary mean what others would want. Let’s hope some of these shops would realize the importance of having more barcode scanner around before it’s too late. Happy consumers are surely behind the success of a company. There are many moments in our life that got erased from our memories as we grow older and older. Those lost memories would become more obvious when you realize you could not even remember what you had for lunch yesterday. What more your childhood, pre-school, high school, college, university or even your working years? Everyone would have those precious moments that sparkled laughter with full blown happiness but how many of us actually remember well enough to tell our children? Moment by moment, day by day, month by month and year by year, those memories became clear marks in our life. 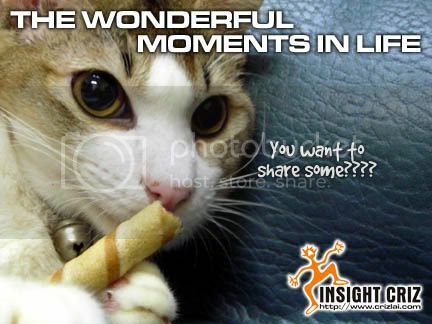 Do all of us have records of all those precious and colorful moments of our lives? There are 3 must have gadgets in life that I would not forgo – computers, digital cameras and camcorders. With the advancement in technology, more and more of these gadgets had become affordable for many families. Parents had begun to realize the importance of preserving the memories of their children in whatever media they could get their hands on. Frankly speaking, I could not remember much of my carefree childhood years although I had some photographs taken when I was a child. Those were static images then but now I want my children to have more than that. I want them live in action. Many years down the road, they would look back into their growing up years and remember all the wonderful years they had gone through. These recorded images would remain as their nostalgic moment for them to treasure and to share with their own children. You would have realized too that I had place computers as one of the main gadget in my life. With internet access, that’s also one important gadget in archiving all the memories in the free online diary or should I say blogs. We have Blogger, WordPress, Blogsome and many more that would allow you to record your daily activities. On top of that, you would have many online photo albums such as Flickr, PhotoBucket, etc, that would allow you to store your photos and videos. For those with camcorders, YouTube would be a great place to store your videos to share with everyone on your unforgettable moments. Isn’t it great to have all the state-of-the-art gadgets to make our lives more memorable? One minute… 5 minutes… 10 minutes… 15 minutes… 20 minutes… Hey! What is going on here? Why is my computer taking such a long time to process my graphical file? Does Photoshop program always take so long to process a simple file? Something is definitely not right here. I think I should troubleshoot this problem once and for all to get my programs running smoothly. Bingo! I think I have found the faults behind the laggings of my computer. I barely have 2GB of hard disc space left in my computer system and I am processing a file as heavy as 100MB. I was so foolish not to have realized the limited working space I have left. Moreover, I should have upgraded my computer memory long time ago. 512MB of RAM was just not good enough if I were to process graphical files or even playing with some online games. 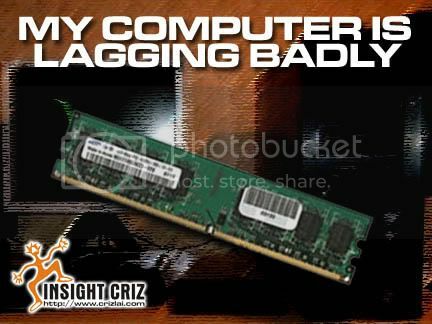 I do not know why it took me so long to find out that adding more RAM will ease my lagging problems. Now I know why. My graphic software required a place to do a lot of calculations and my computer memory was not enough to support that. Eventually my computer decided to switch to using virtual memory from my hard disc and my hard disc space was barely enough for it to process any faster. Moreover, a RAM can transfer as fast as a few gigabytes per second of data whereas the virtual memory can handle only a few megabytes per second of data. Now you know the reasons why my computer lagged so badly. Don’t learn the hard way as I did. Get your computer memory upgraded soonest possible.